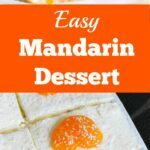 Easy Mandarin Dessert really is that easy! 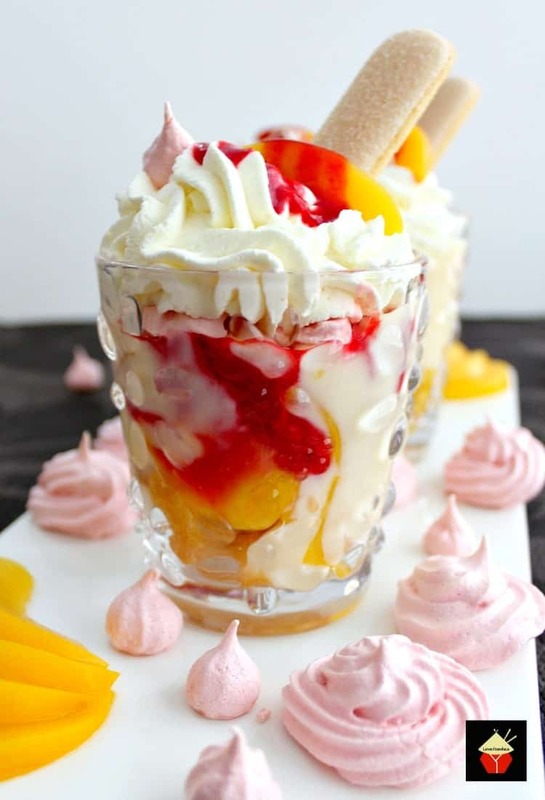 If you like mandarins, vanilla pudding and trifle desserts, then this one is for you! 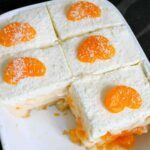 Easy Mandarin Dessert! This is one BIG DELICIOUS DESSERT! Here I’ve come up with a wonderful combination of flavors and textures, and when you take a bite of this dessert… well… it really is very dreamy! For the base, I have used ladyfingers, soaked in mandarin juice. 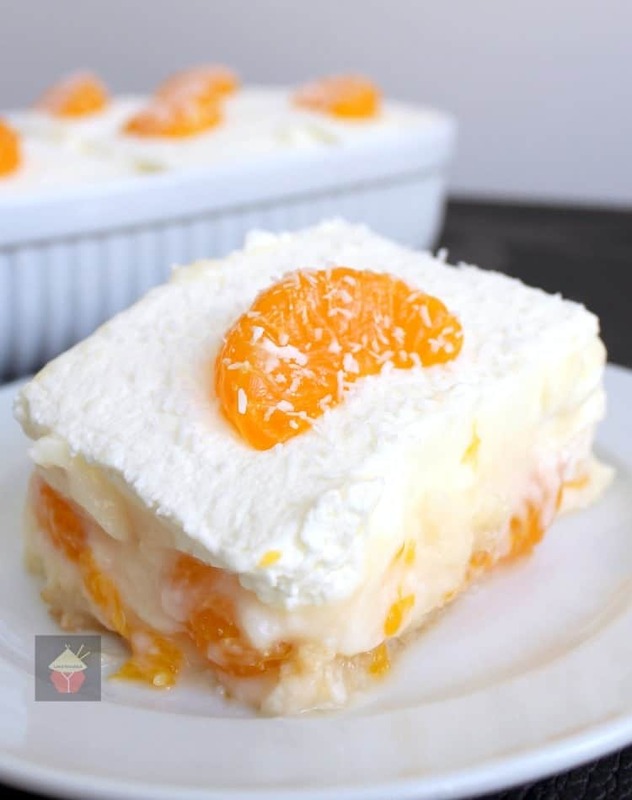 Then, we have a wonderful creamy layer of homemade vanilla pudding, then a layer of mandarins, covered in one more layer of yummy vanilla pudding and then topped off with a generous spread of freshly whipped cream and decoration of mandarin slices and a sprinkle of coconut. So, are you imagining eating this as I describe it to you? 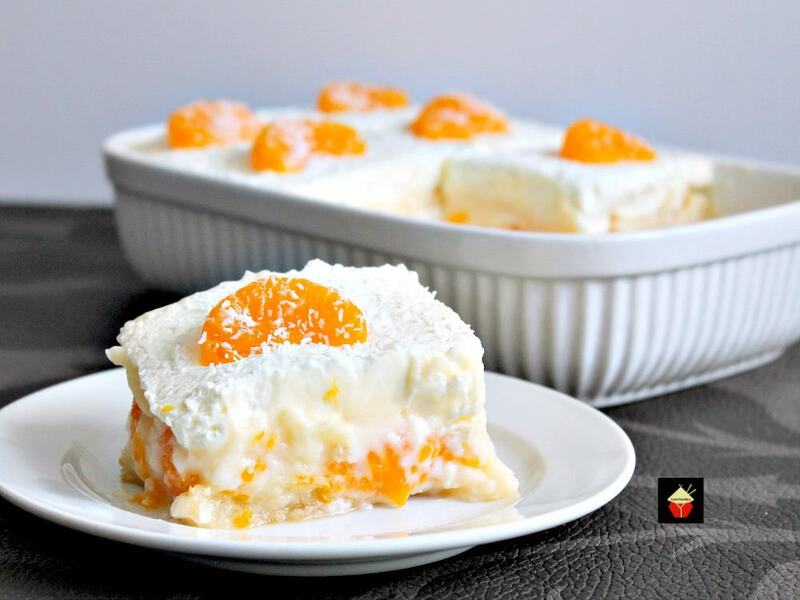 Gosh, it is so delicious, you really must try this Easy Mandarin Dessert! 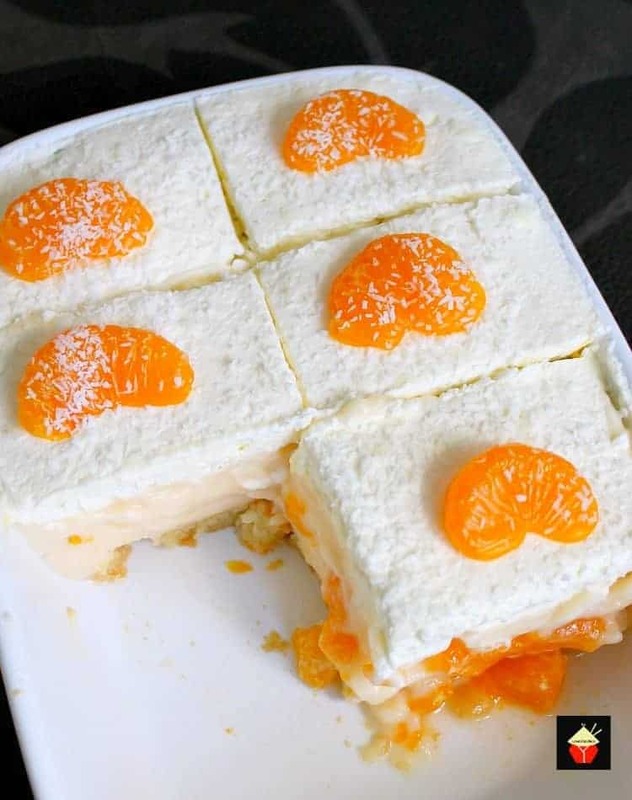 When you take a bite, you get a beautiful sponge-like layer from the ladyfingers, with a taste of the mandarin and combined with the creamy oh so creamy vanilla pudding and fresh cream topping, and then there’s the texture and juiciness from the mandarins. My oh my! You just have to try it yourself then you will know exactly why I chose to call this a dreamy dessert! It’s a bit like a trifle, only this is even better. 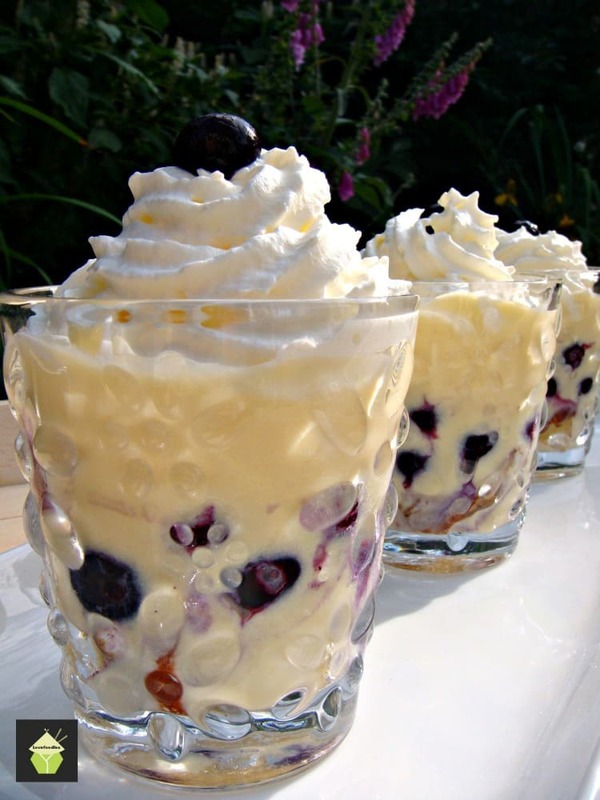 And as if you couldn’t get better than trifle! This recipe makes for 6 servings. Of course, if you wanted to make for a crowd, simply increase all the ingredients. 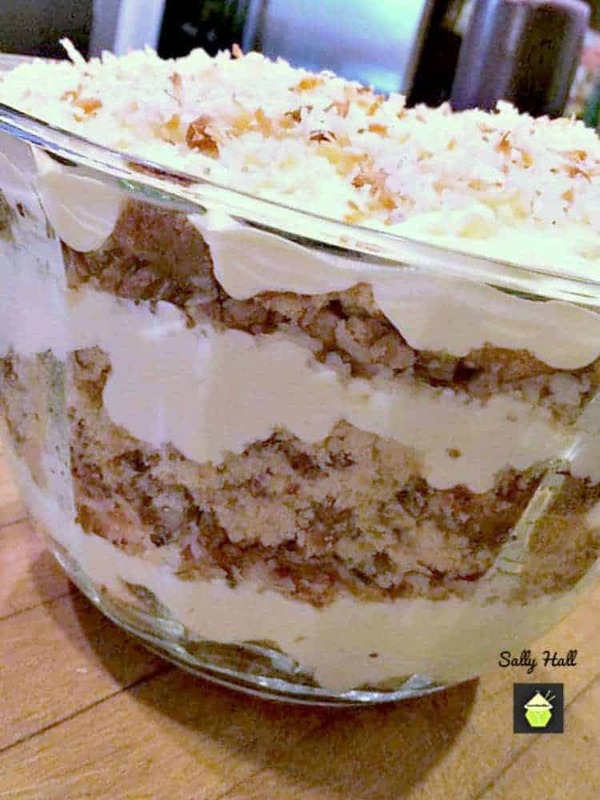 You could make this for a birthday,potlucks, parties, holidays, or to have simply as a weeknight family dessert. Whatever you decide, I am very sure you will enjoy it. The recipe is very easy to make, and even making your own homemade vanilla pudding is easy and quick. Once you have tried it homemade, I am sure you won’t be buying any packet mixes ever again! 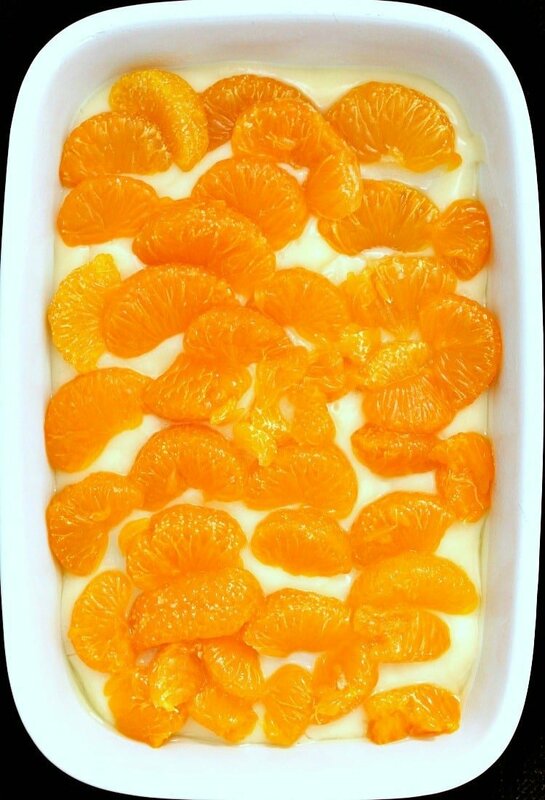 So please do enjoy our Easy Mandarin Dessert and be sure to let us know in the comments below if you made it for a party or a family dessert, and most importantly, if we got the thumbs up from your diners! 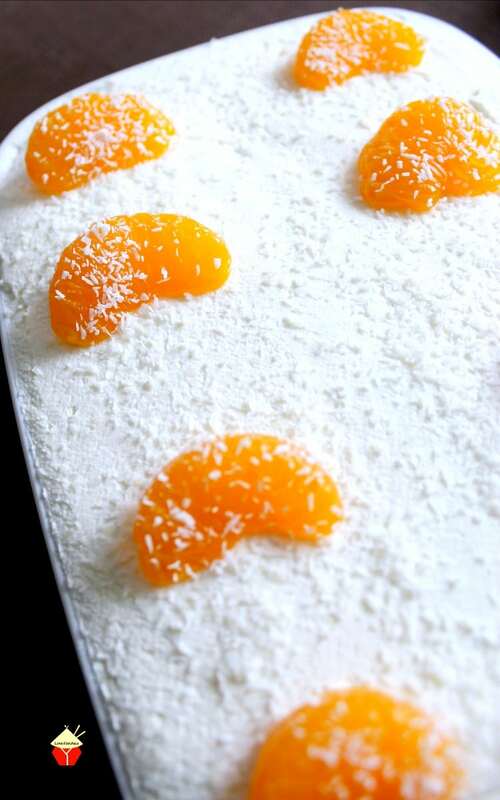 Oh, and if you love this, then do try our Dreamy Pineapple and Coconut Dessert version. That’s also really delicious! 1. 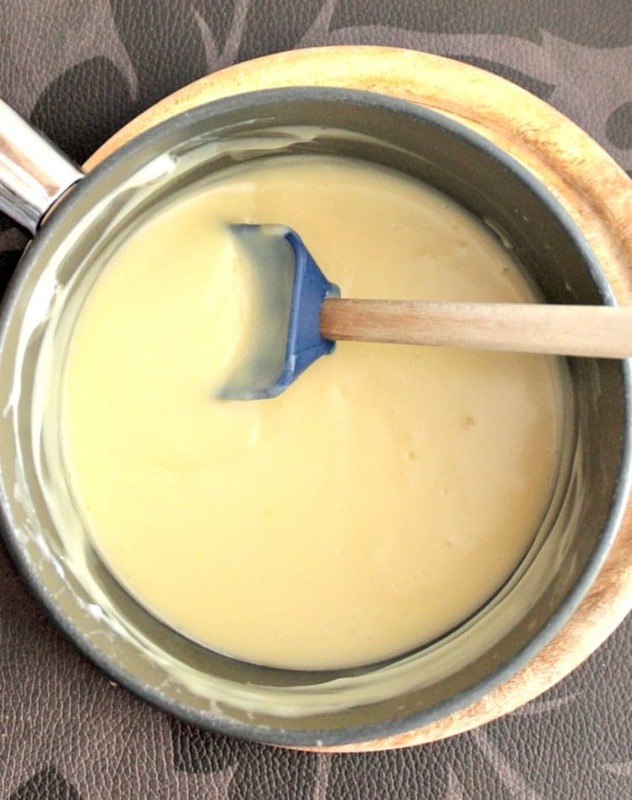 Make the Vanilla pudding as follows: In a saucepan, add the sugar, cornstarch, salt and milk. Stir so there are no lumps and bring to a gentle boil, stirring all the time. As soon as it boils, remove from heat. 2. In a bowl, add the egg yolks and lightly beat. Then slowly pour in half of the milk mixture, stirring as you pour. Return the bowl mixture to the saucepan and bring to a gentle boil, stirring all the time until it starts to boil. At this point, have a little taste to see if you have the amount of sweetness to your liking. If you need more, simply add a tablespoon of sugar at a time and taste as you go along. Remove from heat, add the vanilla extract, stir then transfer to a bowl and cover with plastic wrap to cool. 3. Add the mandarin juice to a shallow bowl and dip each lady’s finger in the juice on both sides then arrange in the dish. 4. Spread half of the vanilla pudding over the lady’s fingers then arrange the mandarin slices on top. Be sure to reserve some nice slices for decoration! Spread the remaining vanilla pudding over the mandarins. 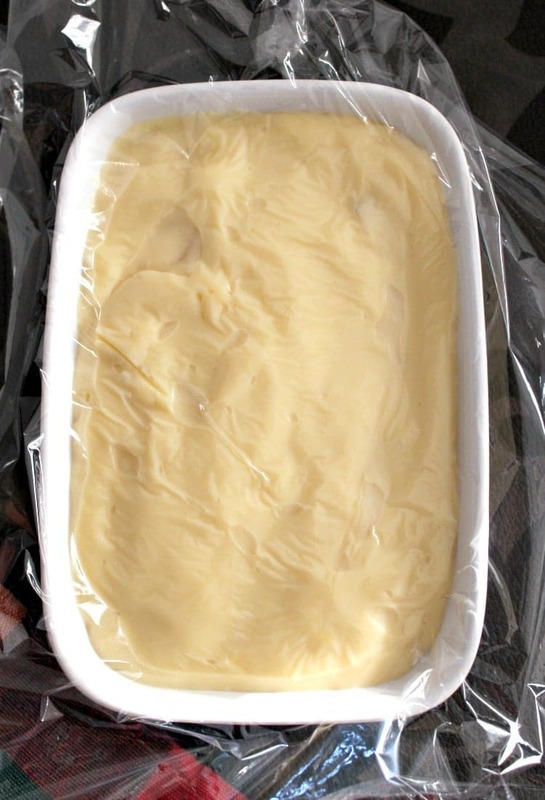 Cover the surface of the pudding with plastic wrap and allow to chill completely for at least 4 hours. Overnight is even better. 5. Whip the cream and powdered sugar to stiff peaks then spread over the pudding mixture. 6. Decorate the top with some of the reserved mandarin slices and sprinkle some shredded coconut on the top and refrigerate for 4 hours then serve. And there you have our Easy Mandarin Dessert. Please enjoy! Here’s a few more delicious desserts for you to enjoy! Make the Vanilla pudding as follows: In a saucepan, add the sugar, cornstarch, salt and milk. Stir so there are no lumps and bring to a gentle boil, stirring all the time. As soon as it boils, remove from heat. In a bowl, add the egg yolks and lightly beat. Then slowly pour in half of the milk mixture, stirring as you pour. Return the bowl mixture to the saucepan and bring to a gentle boil, stirring all the time until it starts to boil. At this point, have a little taste to see if you have the amount of sweetness to your liking. If you need more, simply add a tablespoon of sugar at a time and taste as you go along. Remove from heat, add the vanilla extract, stir then transfer to a bowl and cover with plastic wrap to cool. Add the mandarin juice to a shallow bowl and dip each lady's finger in the juice on both sides then arrange in the dish. Spread half of the vanilla pudding over the lady's fingers then arrange the mandarin slices on top. Be sure to reserve some nice slices for decoration! Spread the remaining vanilla pudding over the mandarins. Cover the surface of the pudding with plastic wrap and allow to chill completely for at least 4 hours. Overnight is even better. Whip the cream and powdered sugar to stiff peaks then spread over the pudding mixture. Decorate the top with some of the reserved mandarin slices and sprinkle some shredded coconut on the top and refrigerate for 4 hours then serve. And there you have our Easy Mandarin Dessert. Please enjoy! Can I use instant vanilla pudding? Hi there, yes of course you can use instant pudding. Please enjoy! 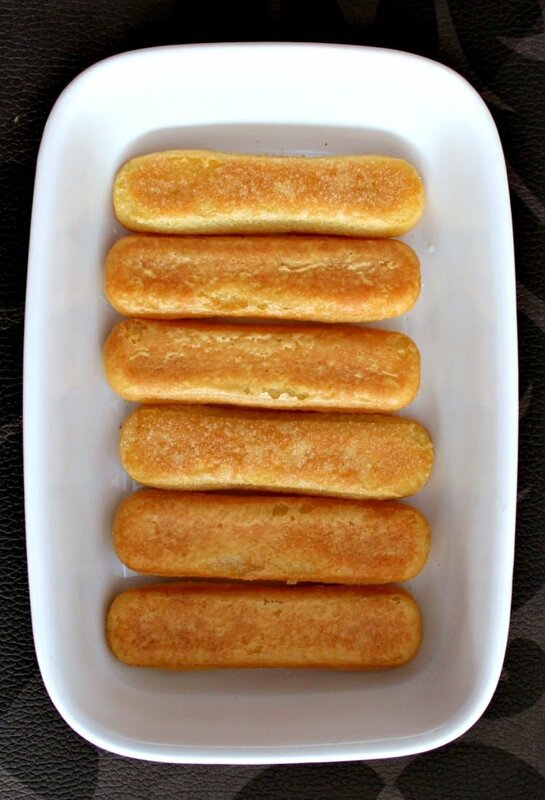 I used vanilla wafers instead of the lady fingers ( had wafers on hand) still delicious! Great dessert! el pudin de vainilla no lleva vainilla?